Is it a shark that just came out of water? Yes, itâs a blue shark. 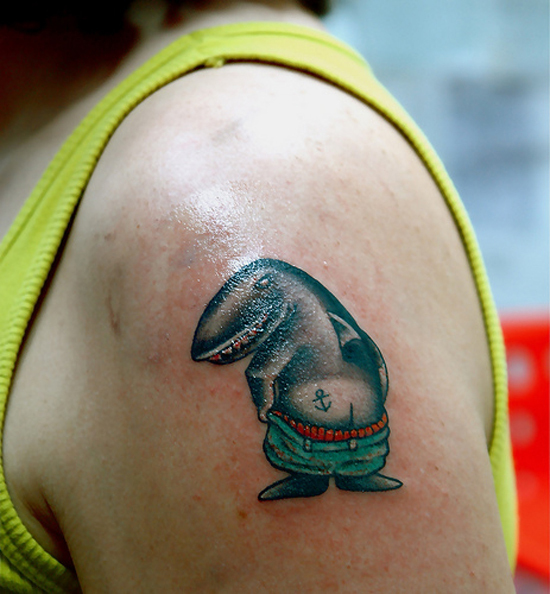 But a shark with low-waist jeans? Must be very stylish! Though the tattoo looks funny, I know getting it inked must not be funny. But how is she going to bear this dangerous creature on her shoulder? I mean the sharp fin and bloody teeth may bite at anytime. Hey, look the teeth are already colored red; she must be feeling hurt then!